Reading an old Peanuts book of mine with my daughter, the idea of writing a “What I did last summer” essay came up. To answer; I took part in quite a feat, or rather feast. A formal, white china, cloth napkin, six course feast for 500 that took place at the base of an old grain elevator, and featured 99% locally sourced ingredients from over 40 different farms and food producers, prepared by nine chefs, a brewer and a cadre of student and other volunteers. We were blessed with a perfect October day and overall the meal went off without a hitch. Platters created by local potters were carried by deft servers and then sold at a silent auction; a team of photographers captured the beauty of the table, the food, the joy of the guests. A standing ovation for the chef team brought tears to my eyes and made all the work worthwhile. You may have heard tale of the dinner or seen the wonderful photos by the Bryce Bridges Photography team, but I wanted to follow up and tell more of the story of how the meal came together and the amazing people who grew and produced the food we ate that day. It all started with a call in March of last year from Anne Trumble, the founding director of a new non-profit in Omaha called Emerging Terrain. She had a project involving large scale art banners to be hung on a prominent former grain elevator and wanted to celebrate the juxtapositions further with a local food dinner much like those of Outstanding the Field. In my past life I would have been on the art side of the project but Mark Masuoka, the Director of the Bemis Center for Contemporary Arts actually referred Anne to me for help finding enough local food. I was hesitant, having no event planning, catering or even real restaurant experience; but ultimately signed on when we began talking about hiring a caterer to actually execute the meal. We had hoped that the Institute for Culinary Arts at Metropolitan Community College would be the ones to create the meal, but we could not figure out a way to incorporate the event into the curriculum. We knew we would find other ways for the school to participate, so we met with one of the larger caterers in town and it sounded promising. Though, as Anne and I discussed the event further, we decided there were opportunities here we could not ignore. We decided sometime in May to take the leap of inviting ten local chefs who were already utilizing local food on their menus to create our massive dinner. Knowing it would be a tremendous amount of work and considerably more challenging than simply hiring one company to do everything, we held our breath and dove in. I hand-picked the chefs and sent out invitations to most everyone I could think of that was already working with local farms and ingredients. We would meet up at the temporary Emerging Terrain office space, discuss ideas, see who showed up and who would ultimately commit. With local mozzarella, tomato, basil and cibatta bread set out, most of our final team came with excitement, ideas, questions, nervousness, and enthusiasm. It was decided that we would try to find a way to use Metro’s fabulous new culinary facilities for the dinner preparation and that the chefs would work together that weekend. It was agreed that the tone of the dinner would be formal and sit down, not burgers and barbecue and that it would be a chance for the chefs to feature what they do best. It was also clear that a Sunday afternoon would be much easier for everyone to participate in and avoid the need for extra lighting. Setting the table with jars of pickles, honey, preserves, bread and butter and then serving family style for every ten people was something everyone was eager to see. We were especially impressed with Chef Clayton Chapman’s presence and excitement. Everyone knew he was in the midst of opening a new restaurant with the goal of being the greenest in America (a goal he did meet in December with The Grey Plume and you should check out the elegant space with the amazing menu), but he made the time to participate fully. Everyone came away thinking this is a little crazy, but we think we can do it. After all, pulling together ten chefs, who knows how many farmers, renting every piece of equipment, transporting hot food and serving 500 people outdoors with no running water was not something any of us had ever done before – not even close. The next step I thought would be menu planning. Our meeting on-site in August happened to be on an unusually drizzly, cool day so we did not spend much time looking around but moved over to Chef Paul Kulik’s The Boiler Room to discuss the menu and many other topics. We did not have everyone in attendance but enough to make some menu decisions happen. It had been determined on-line that the chefs would work in pairs with each team taking a course or protein. Getting together in one of our chef’s restaurants seemed like a good idea until we were all overcome with the delicious food, striking setting and general conversation about eating. It would have been much more effective (and cheaper) to meet in a starker setting, but we were glad to support and experience this amazing place. So the chef teams and courses were set, but the menu remained elusive. In the future, I would provide a pantry with updates on what I could get and let the chefs make their magic happen as they prepared the food. Printing a menu was important, but needed to be a very last minute endeavor in order to let the process happen as smoothly and naturally as possible. That is what eating locally and seasonally is all about, but I got caught up in all of the other needs in pulling off this dinner. Speaking of these other needs, I was also working closely with United Rent-All to make sure we had all of the equipment we could possibly need; Tent Event, to make sure we were covered (literally) in case of rain; and ordering some odds and ends like fabric markers (painfully the wrong kind!) and extra trays (compostable from Verterra). I had heard at the beginning of the planning that there were not enough serving trays in town to have a multi course meal for this many people, but I did not believe it until I started trying to line them up. So in one of our many creative tangents, I approached Tom Harnack at the Omaha Clayworks about having his group create platters for the dinner. He was not sure with the time frame how many they could pull off but agreed they would try for 50 to cover one full course. They all came together and worked so hard to get them done and delivered on time, that we decided, while we were setting up the day before the dinner, to sell them at a silent auction, adding another crazy but fun element to the day. Tom and his group graciously agreed to man the tables and they ended up selling most of the pieces which were on view as guests walked in. The platters then had to be rushed over for service, washed quickly but carefully and picked up on the way out. A million thanks go out to everyone who made this special aspect of the dinner possible. While Anne was busy lining up all of the permits and funding, I began the actual food sourcing, what I had originally thought would be my only job. I spent most every Saturday at a Farmer’s Market anyway, so I was able to discuss with the farmers each week how the crops were looking and what may be available. When I began, I was seriously afraid we would not have enough food to feed 500 multiple courses, but it soon became clear that we would have an abundance to choose from and I would not be able to include every grower out there. That was a particularly exciting time for me, seeing just how much food was being grown and produced meant the tide was truly turning in this area and that growers and restaurants could begin discussing purchasing almost year round. I truly feel this is the needed next step beyond direct marketing for farmers to begin expanding food production if we are to ever think about feeding schools, hospitals and everyone in our communities. Organizing volunteers was yet another full time job that needed to be done. We hoped as many students as possible could volunteer that weekend to be a part of such a unique cooking and dining experience. I had also hoped someone would show up who would organize all of the volunteers for the weekend of the dinner, but that did not happen until the last minute. When Joyce Bernard came onto the scene, I knew I had a powerhouse of behind the scenes assistance. Joyce, her sister Joanie and their families were unbelievable in their efforts securing champagne, setting up, serving, and cleaning up. From the Saturday table set up, which actually would not have even happened without them to the last dish tucked away under the tent before finally going home to rest; these ladies were unstoppable, creative, positive, supportive and generally fabulous. They created the beautiful table displays from flowers they scavenged the night before the dinner which they then folded into the napkins at home all night. More flower arrangements, organizing, table moving, serving, and sunny smiles helped make the day run as seamlessly as possible. I cannot begin to thank these women and highly recommend them for any project they get involved with. Another creative side project that came up during the planning stages of the dinner was a photo shoot pairing a chef with a farmer. This brain child of Bryce’s would hopefully lead to a gallery show, restaurant photos, perhaps even a TED talk. Coordinating the food purchasing was difficult enough, but try adding schedule pairings to actually get chefs and farmers into a room together. I heard tale of pigs being brought up in a truck, but they were not ultimately included. I am still not sure how it all happened and have not had a chance to see the resulting photos, but I am sure whatever form this project takes it will be gorgeous, interesting, thought provoking and add more needed exposure to both groups of people. And that brings us to the week before the dinner and my hundredth phone call on an old track phone that sounded like a tin can. Stopping by United for the tenth time to work with those patient women on all the dish details. Clandestine meetings in parking lots to pick up walnuts, eggs and honey; visiting markets in Lincoln and all over Omaha to pick up over 250 jars of various preserves and butter and more honey. Trying to find room in my house and freezers for everything until I could deliver it to Kevin Newlin of the Kroc Center, who is another unsung hero of the dinner. When the Metro kitchen did not pan out, we were referred to Kevin to possibly rent storage space, kitchen space, or parking lot space for a refrigerated truck (thank goodness that did not have to happen). Kevin very amiably agreed to let us use the kitchen for prep and as much storage as he could spare, which was not much and I am sure put him in some tight spots for his own meal prep that week. Paul Kulik met me over there one morning to look over the space and was wonderful about going over all of my notes to help determine final details on site set up, equipment rental, food transport, and kitchen use among other things. He professionally and efficiently answered most all of the remaining issues I had and I am not sure what I would have done without his help. As the ingredient lists were finalized, it became clear that we were going to be able to pull off an almost 100% local food meal. That’s 6 courses, beverages, bread, and other accompaniments, almost all sourced within a hundred miles or so. We did allow salt, pepper and olive oil to be used, but everything else was grown or processed locally. The coffee was roasted locally (though a sad electrical problem prevented us from serving it), the bread was not made of locally sourced ingredients, but baked locally, and the sugar of course was not raised locally but sourced though the Grain Place in Marquette, Nebraska. I so wished I could have included more farmers, but did the best I could under the time constraints. I would not want anyone to feel slighted and they should know there will be more dinners and the attention given to local food production in general should hopefully give them some new customers. An area that deserved much more attention and accommodation was the media. It was not as high on our radar as it should have. We had some prior communication with various news outlets, but the tickets sold out so quickly that we did not know where we would put any reporters let alone how we would feed them. As the chefs were expecting full food reviews and other write ups on the dinner, I feel I really let them down in this regard. We should have set up a media table at the last minute and worked to make sure they had a platter of each course. I am not sure how we would have done it, but the “roving reporter” option we gave instead of comp tickets did not seem to work out. There was a sad lack of coverage which I hope has not been too terribly disappointing. I am hoping this write up may garner a bit of attention, though later than I had hoped to post it. So Thursday night before the dinner found me taking my visiting father to the Lied Lodge for dinner and to pick up apples, where we were blessed with Chef Matthew Taylor’s offer to cook for us off the menu. The bison was a marvelous preview of what was to come, and the restful atmosphere was a welcome respite to the crazed week. Matthew was a brilliant addition to the chef team and hopefully working on the dinner he felt welcome to Nebraska as he had only just arrived from Minnesota for a strong local focus on the Lied menu. Friday we were off and running picking up last minute ingredients and dropping them at the Kroc, though unfortunately not in time for Chef Kevin Shinn who could only come up to prep this day but did not get a hold of me in time to coordinate the delivery. Kevin was professional and passionate about this meal as he always is in his cooking. His is the only restaurant I have ever seen with a listing of the number of head of animals he is purchasing each week on the door. If you have not checked out the bread & cup in Lincoln, Nebraska I highly recommend that you do. The day ended with picking up cream and half and half at a sales rep’s garage in west Omaha then making the 500th to do list for the next day. Saturday found us at the site with tables, tents and water delivery and a very small but determined volunteer group to set up. I regret that they were not fed that day – I again can’t thank everyone enough for all of the work getting the tables lined up perfectly. Stopping at the Kroc to check on the chefs, I found Tim Shew from La Buvette methodically cutting up chicken after chicken as part of Clayton’s team of volunteers. They had a tight crew that worked hard and long to get ready for the next day’s final cooking. The box of band-aids next to Tim was an indication of his dedication to the process. The day ended with me working on flower arrangements while waiting for our night watchman and a visit from Brigitte McQueen, one of our pastry chefs who would evolve the next day into a kitchen manager extraordinaire. Anne attended to an event at the Joslyn Art Museum displaying the mini banners, while I went home to crash. Did I mention I was nursing a teething toddler through all of this? Sunday morning of the big day and I had to send my partner to Lincoln to pick up bread and ice cream, so my 19 month old was basically attached to my body all day. We arrived early to get the table cloth out to start setting the table, which were actually 65 eight foot tables all in one long line with about five breaks to pass through. My focus was the chef tent, but after finishing dessert prep with the ever delightful and professional Jacqui Caniglia of La Charlotte-Caniglia Pastries, Brigitte took over this task. I began to feel a little extraneous as Thomas Sibbitt, our stunning Maitre D, prepped the servers. When I finally got the call from the infamous Brian O’Malley of the Sage Bistro and Metro’s ICA faculty, that the Lied Lodge crew was on its way and then the call from the Kroc team made it began to sink in that this was really happening. And it was going WELL. Nebraska Brewing Company arrived to set up their special brews and flowers from Black Sheep Farms added to our other displays. The table was looking splendid indeed as the pedicab, bike valet, giant bubbles, and other details were set up. Elle Lien of the Daily Grub had to do some quick and gracious improvising on her beet dish and serving ware, but everything she prepared that day was the talk of the town. The coffee incident, an order for way too much ice; and sending Anne to the store for more charcoal were some of the minor mishaps that occurred over the course of the day. The volunteers’ meal was not properly coordinated and recycling, composting and clean up needed a full time coordinator that was not me, but overall, compared with what could have gone wrong, the day was miraculous. The weather was gorgeous and the guests arrived in waves that appeared not to end. But at about five past two, suddenly, amazingly, everyone was seated. 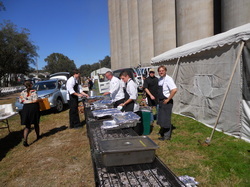 The chef teams became a unit that appeared to have done this many times before as they gathered to heat each course over five grills and plate with precision and care. Servers began bringing out platter after platter after platter of the stunning and fabulous dishes. Beer poured generously, conversation flowed among guests, some seeing old friends for the first time in years, some meeting new ones that may last for years to come. The menu and banners were discussed, food in general, the weather blessing, and it was over all too soon. As Clayton put it, can you believe all of the months of work over in just 3 ½ hours? Oh, but what a few hours! That standing ovation was icing on the cake for me. Seeing all of that amazing food, seeing how we all amazed ourselves at what we accomplished and seeing the joy and celebration in everyone’s faces that day; it brings tears to my eyes again thinking about it. The food, oh the food, deserves such accolades that only a true food writer can offer, but I will try to hit the biggest highlights. To start the meal, creamy, sweet pastured organic butter from Clear Creek Organics was a welcome surprise for most people. Bottles of wine vinegars from George Paul Vinegary were another treat that many people did not realize was being made in north central Nebraska. Elle’s squash and polenta dish was one more unexpected aspect of the meal as it was vegan and featured locally raised organic corn. The amazingly moist, tender chicken roulade was simply adorned with another variety and preparation of squash. The hand-made clay platters featured the pork dish, or dishes I should say, as each tray was a different combination of every bit of two whole hogs including two tables receiving the heads. The bison dish was designed to celebrate the use of an entire bison from head to tail. Bottles of champagne on each platter (hand -made for the dinner by the Arbor Day Farm) should have popped the corks as they arrived tableside, but without the proper temperatures and sizes they needed a little manual help in opening, but the effect was just as dazzling. Perfect desserts of apple crisp, carrot cake, sweet potato cake and honey chevre ice cream and absolutely delicious beers complimented to meal to its perfect end. I intend to write blog entries about each and every farmer and food producer for the dinner as they have yet to all be called out individually, but it will have to suffice to list them here with links to their websites and contact info. Please take some time to check them out, look for them at a local market and find others near you. Without these folks, this phenomenal dinner would not have been possible. Without them, your food choices would be greatly diminished and without them we can’t continue to live well in our society. And finally I must once again thank Anne Trumble, for her vision, for including me in this project, for sticking with me even when she thought I was bailing, patience when I lost mine, and for understanding that my daughter comes first no matter how many people are waiting for dinner. She charged ahead and made this project come to life in the face of difficulties, set-backs and lack of support at times. As a community I know we hope that she continues to pursue her many ideas for Emerging Terrain. And as a friend, I wish her Helvetica, godspeed, joy, good food, great drinks, very little red tape, and lots of Pedialyte. WHY: Stored Potential is a large-scale installation covering the silos of a vacant grain elevator in downtown Omaha, Nebraska that interprets the interrelatedness of land use, agriculture, and food. On October 3, 2010 at 2pm, over 500 people gathered at the base of the grain elevator and its temporary giant mural for a dinner of epic proportions. Nine prominent local chefs prepared and plated a five-course meal on giant platters brought to your table composed of seasonal, locally farmed ingredients. The site, scale of the event, and quality/presentation of the food created a once-in-a-lifetime experience. Tickets to this event were available on a first come first serve basis on August 1, 2010. Each ticket was $50 and included at least two drinks of specially brewed beer or root beer crafted by a Nebraska Brewing Company, with apple cider from Kimmel Orchard. The chef team included: Clayton Chapman, The Grey Plume; Tim Shew, La Buvette; Paul Kulik, The Boiler Room; Brian O’Malley, ICA; Kevin Shinn, Bread and Cup; Matthew Taylor, The Lied Lodge; Brigitte McQueen, Bemis Underground; Jacqui Caniglia, La Charlotte-Caniglia Pastries; Elle Lien, The Daily Grub. With bread from Bread and Cup, Le Quartier, Bread Oven; cheese from ShadowBrook Farm and Branched Oak Farm; ice cream from Ivanna Cone; vinegar from George Paul Vinegary; local honey, preserves, pickles, and salad, almost every ingredient of this feast has been locally sourced. Purchasing included two whole pigs and one whole bison creating a nose to tail dinner and responsible meat purchasing, with no waste. Even sugar was brought in by the Grain Place in Marquette from Global Organics. All of the senses were engaged with hickory smoke, whole hog heads, colorful flowers, gourds and grasses and of course lively conversation. There were fabric markers on the table for those inspired to design their own banner or leave thoughtful comments. Dinner was served family style for every 10 people, allowing guests to discuss the food, art and site. The banners were printed on a human scale and hung close by to see the work in detail. All of the artists were present as well as many of the growers and food producers. Platters were made specifically for this event by Omaha Clayworks and Arbor Day Farm and available for sale in a silent auction. As there were no more seats left at the table, we invited the media to attend as roving reporters with the chance to see the action up close from all sides. Along with great photo opportunities, they were able to interview artists, guests, growers, sponsors, chefs, and the Emerging Terrain founder, Anne Trumble. Samples all of the food and drink were available to them and a more personal and unique experience of this event. Lori Tatreau is an MFA graduate from Hunter College looking for new ways to create an art practice that satisfies a deep need for social transformation. The equally deep need for sustainable local food has taken over as a priority, along with motherhood. She is currently exploring avenues for satisfying all of these needs at once.